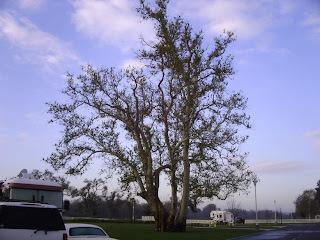 One of the many giant cottonwood trees in the park. 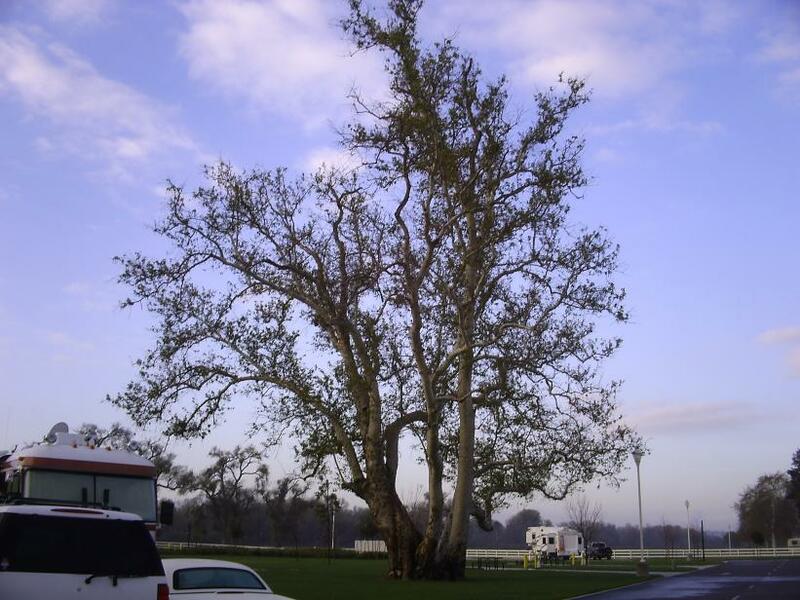 This one will give us great aftenoon shade this summer. 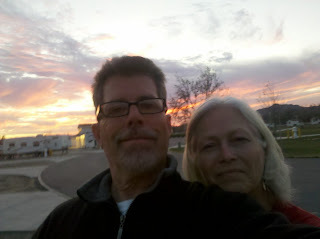 Elaine and I have been enjoying our first month here at Rancho Jurupa (pronounced hurupa). Up until a few days ago our only job was to move our coach every week, or so to a different spot while we wait out the advance reservations in the system. We've been meeting the various camp hosts as we move around the park, and when we pass through the check station re-entering the park each day, but so far we had not been assigned any office, or field duties. When I was entering the park last Saturday after a visit to Home Depot, Jennifer asked if we could come into the office Monday morning at 6:30am for opening orientation (the procedure for opening the check stand each morning). We met Terri, a fellow camp host, just after she had opened the office and she showed us how to shut off the alarm, and went through all the procedures for getting ready to open at 7am. Usually, the first big rush of the day is all the fishermen lined up at the gate coming into the park to fish for the day. As they wait in line we must ring up their fishing ticket on the register, make change, sell bait, answer questions about when the lakes were last stocked etc. Fortunately, Monday was a slow day, and Terri was able to take us through the process slowly and we each were able to take turns taking care of our customers. Their computer program is very intuitive, and relies heavily on "touch screen" technology so it really is easy to learn. We spent a pleasant 2 hours with Terri, and then returned to our coach around 8:30am to begin moving our coach back to Space 215 where we will be until March 3rd when we must move back to 257 for a few days. In addition, our detailing guys (Integrity Mobile Detailing) were coming at 10am to wash our coach, trailer, and two cars. I think that's the first time we have had them wash everything in one day, but with our cars now outside 100% of the time the get dirty faster. When we got permission for them to come in the park there was a lot of interest among the other camp hosts, and we provided a supply of business cards for them hoping others will begin to use them and help expand Integrity's business base. We really like these guys, and they do a good job. After our "opening orientation" we were asked to meet with Jennifer the next morning (Tuesday) at 9:30am for general office orientation which involves checking in campers with advance reservations, and keeping track of how many people and vehicles in each site. Park rules limit the number of motorized vehicles to 2 per site, and a total of 6 people per site. Any additional motorized vehicles, and/or people must pay an additional charge. There was lot of information and no doubt I will need a refresher course. My 61 year old brain is full, and trying to absorb 2 hours of technical procedures in one sitting is a challenge, to say the least, but we are enjoying meeting all of our co-workers, and making new friends. Well, I'm sitting here typing this journal entry and watching the ground fog evaporate as the sun peeks over Mt. Rubidoux to the east. What a great life we have, and we are so thankful for this new home and friends. On Sunday two of our adult children and their significant others came for "Sunday dinner" around 3pm. We BBQ'd hot dogs and hamburgers, lit the portable fireplace and sat talking until almost 7pm. For the first time in a year, or so we set up the Camp Chef stove, which has a grill box that sits on two of the three burners so we can BBQ. It is a great system, and now we can just hook it up to on our onboard propane system. Elaine put up some decorative awning lights she bought a few years ago, but had not used yet, and added a lot of ambience to the evening. We woke up to rain this morning......and I was reminded of that Albert Hammond song from 1973....."It never rains in Southern California". So, the forecast for the next 4 days is rain and temps in the low to mid 50's (cold for SoCal). On days like today I miss my garage that I can drive into and exit my car without getting wet. It is a small inconvenience, but it is one of the realities of fulltiming in an RV....some of the conveniences of a sticks and bricks home are missed on days like today. In the background you'll see I have put my tire covers on....these are new. The old ones were literally falling apart so I bought four new ones from Campingworld online. These guys are very sharp. After I had placed the order for the tire covers (the evening before) I decided we needed a new entry step and went on their website again. I saw that if my order was over $125 that shipping would only be $5, so I called their "800" number to see if I could piggyback the platform step onto my order from the night before.....the young lady who answered knew who I was without me even providing any information, just based on my phone number. Her computer matched my phone number with my account, saw the platform step in my "CART". She quickly added the step to my order and revised the total as well as the reduced shipping rate, and I was done in less than 3 minutes. How slick is that! 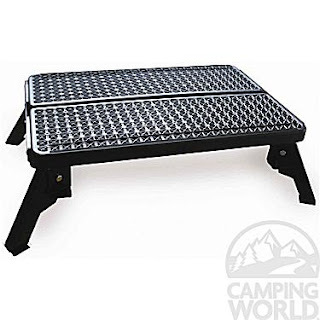 Our new Stromberg Carlson Platform step! Last night I attended the annual AGM (annual general meeting) for my high school soccer referee association, and was notified at the end of festivities that I had been awarded a CIF (California Inerscholastic Federation) playoff game scheduled for this Friday, and it's supposed to be raining then......my father had a saying that is so apropos....."if it wasn't for the honor I'd just as soon pass....", but it is an honor and I will proceed with style....wet or not! So, that's it for now in our wet world.....thanks for reading! Usually the phrase "moving day" conjures visions of the open road, and new vistas. In our case it simply means moving from site 215 to 257 on Friday for the weekend, and then back again on Monday. Rancho Jurupa allows reservations for specific sites up to 6 months in advance. As you would surmise, site 215 had a few reservations outstanding for the next six months so we will be moving periodically to 257. This past Friday was one of those moving days, but today we get to move 1/2 a block back to our preferred site. This is the first weekend we have been here as camp ground hosts, and the weekends are certainly a different experience when viewed from the perspective of a fulltimer. During the week there are probably a dozen rigs here, including camp hosts. 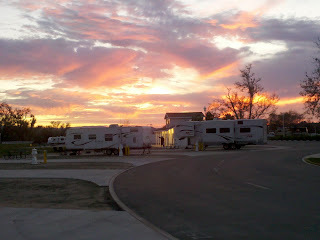 On the weekend Rancho Jurupa becomes a small village with up to 140 RV's (80 sites in the Lakeview Campground, and 60 in the Cottonwood Campground, where we are). In addition to that there is a large tenting area which is on a first come, first serve basis. On holiday weekends like the one just passed on our population swells from a couple of dozen residents to 6-700, plus all the day use peopel who come for picnics, fishing, etc pushing the population to 1,000, or more. Overall I like the feel of the park on these weekends. Generally everyone is very well behaved, and it never seems too noisy. People are respectful about how loud their outdoor stereos are, and there is plenty of room between sites so you don't feel like you are sharing your site with your neighbor. While I fulfilled a couple of morning soccer assignments this weekend Elaine continued her winnowing of our interior storage. She was able to remove a large trash bag of duplicate items, and individual items no longer being used ranging from toiletries to glassware to pots and pans. 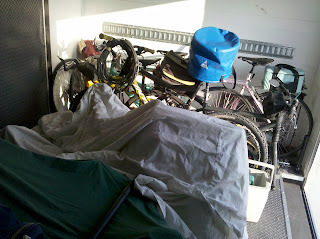 I was able to reorganize the trailer so I can now access everything more easily, and can see pretty much everything. We enjoyed a couple of hardwood campfires Saturday and Sunday evenings. I love hardwood fires....they burn hot, and slowly without the bonfire effect. The biggest challenge for me, individually, is to develop new routines, and new organization....that is my nature, and having set routines and things organized creates a sense of peace and calm. I am getting there, and am enjoying the process. I've already had time to complete some minor repairs that have come up over the past few months, but since I didn't have daily access to the coach, were hard to complete. NOW I have daily access and things are getting done! Three examples: 1) My coach has two slide out drawers in the storage just to the right of my mid entry door. The top drawer had a lot of odds and ends in it (automotive bulbs of all sizes and applications, extra windshield wipers, marker lights, headlights, misc. screws, bolts, fuses, etc.) The bottom drawer, the bigger one, had/has most of my tools, plus a spare house water pump. I went through all the bulbs, etc. in the top drawer and disposed of the uneeded and/or duplicate items. NOW I can find things! 2) Door latch - the original door latch (for the entry door) just wouldn't hold the door open anymore, even with me continually replacing the rubber gasket, so I bought a new latching type one 2 years ago, but had never installed it. We were holding the door open with a bungy cord. Now it is installed. 3) The lid that covers the stove top has stainless steel glued to the bottom side so when open it provides an attractive, cleanable surface. It had begun to come lose.....no doubt the 29 year old glue was giving out. That got fixed yesterday! As I move through these projects my sense of well being increases. Like a fewllow Newell owner says, often, "I like things to work" and look good on my coach. Soon, God willing, another Newell friend and I will get together and tackle the 3, or 4 electrical issues I have been stalled on. Elaine has been going through all the interior storage areas sifting and winnowing, and has created a significant amount of extra space. We've had to change over from travel mode to living in mode, which means a lot of things we kept in the coach for monthly trips is not necessary now that we are sitting in one place most of the time. When we travel, as we did last weekend, we will just load our vacation stuff back in...meanwhile, we have a lot more space to live in now. So, that's my story, and I'm sticking to it. Just got a reminder on my Droid smart phone that I have jury duty today......uggh! I'll be off the office to set up my new laptop that arrived via UPS yesterday.....my old laptop is giving up the ghost, and I'm trying to be proactive in replacing it before it crashes for good. I've been able to resurrect it twice so far, but I'm sure it does not have 9 lives like our cats...haha! A few weeks ago before we knew we were going to be accepted as camp hosts I made arrangements with my brother to meet him and his wife in Ventura this weekend. We love visiting Ventura in the winter, because it is so easy getting a spot right by the ocean. Southern Californians don't like to camp so much when it is under 60 degrees, and that makes it easy to snag a first come, first serve spot right here on Rincon Parkway, just 4 miles north of the city. The front of our coach is 30 feet from the water, and the temperature has risen all the way to 63. Elaine and I are doing a little office work since it is, afterall, Friday, and we are not retired yet. In a few minutes we'll drive into Ventura for lunch at the Anacapa Brewing Company (ABC). ABC is a micro brewery that we have been visiting for 6 years. Great beer, and food! Here are a few pictures.......thanks for reading. What a great day on the Pacific Ocean.....had a great lunch at ABC with my brother and his wife, stopped at the local Von's supermarket to pick up some filet mignon's and headed back to Faria. Took an hour nap....ohhh that felt delicious to lay down and not have to get up to be anywhere at any particular time! Around 5:30 I got the Sea-B-Que BBQ out and grilled our filets while Elaine prepared some great asparagus and salad, the sat down with my brother and his wife for dinner while the sun set behind us. What a great evening. Sat by the fire for about 4 hours chatting, and laughing....like we usually do. My brother and I are separated by 14 years which was a big deal when we were young, but not so much now that we are 61 and 47....today is his birthday....he's not the baby anymore. Yesterday, February 1st, I was leaving the park to head for the office and saw Ranger Dana driving into the park, so I pulled a quick U-turn and caught up with her at the new cabins. I asked if she had received the results of our back ground check, and she answered she had just received an e-mail on her phone confirming we are not felons. So, our start date was officially yesterday. We are ensconced in site 215, an 80 foot back in concrete pad. 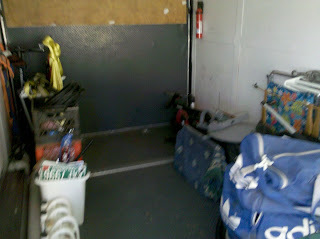 That should be long enough for our coach, trailer and two cars, but we will find out tomorrow. I just brought the trailer here from storage, but it is sitting in site 214 temporarily as I had to drop it quickly and head off to officiate a high school soccer match. 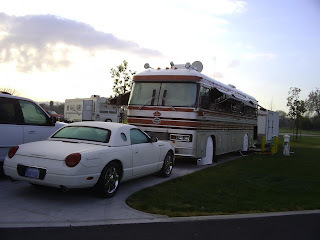 So, tomorrow morning I'll unhook the coach, pull it out of the site and then back the trailer in......will probably have to push it back to where the rear wheels are at the edge of the concrete to make it all fit, but I'm sure it will work. After I got home, around 5:30pm (after dark), Elaine prepared some of her famous burritos, which I washed down with a very cold Newcastle. Next we headed over to the trailer to reorganize the stuff inside so we could find things when we look for them in the future. I'll take a picture of all that we are currently storing in there. We also transferred our DirecTV DVR receiver into the coach and it works great. Now I need to run a second coax cable from the LNB on the satellite dish so we can record one channel while watching another. That will be a project for after we return from Ventura, where we are headed tomorrow for 4 days to unwind from the hectic past three weeks of moving. Looking forward to some down time........my brain is full, and my body is tired....gee...you'd think I was 61, or something.....haha!!! Thanks for reading.....stay tuned for great pictures of the Pacific Ocean, and a few great sunsets thrown in for good measure!